Alkalinity, also referred to as carbonate hardness or buffering capacity, is essentially a means of quantifying the stability of pH in a solution, such as aquarium water. In an aquarium, weak acids formed by oxygen respiration and the decomposition of organic material gradually deplete alkalinity. If left unchecked, the alkalinity drops below a critical level and pH begins to fluctuate more wildly than is normally suggested (a daily pH shift of +/-0.2 is normal in marine aquaria), causing stress to livestock. Alkalinity is also depleted by reef-building organisms during the production of aragonite (~60% carbonates by weight), and is therefore very important for their rapid growth. 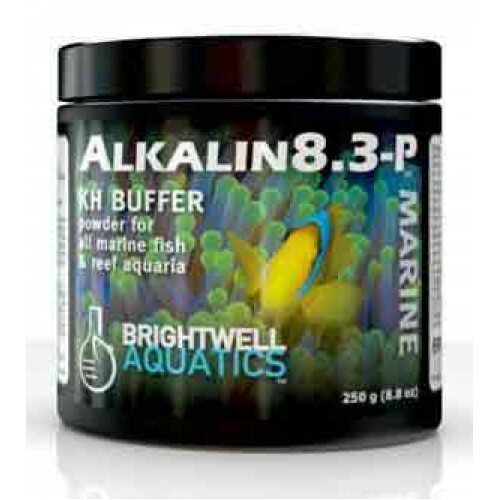 Maintaining the alkalinity in marine aquaria between 7 - 12 dKH (2.5 - 4.3 meq/L) will generally maintain pH within the desired range. 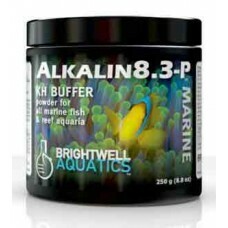 Advanced: Create a stock solution by dissolving 20 grams (~5 teaspoons) of Alkalin8.3-P in 8-fl. oz. of fresh water (preferably purified); each ml of the solution will increase the alkalinity in 1 US-gallon (3.785 L) of water by 0.36 dKH (0.13 meq/L). [Reference: Each g of Alkalin8.3-P will increase the alkalinity in 1 US-gallon (3.785 L) of water by 6.8 dKH (2.5 meq/L).] If initial alkalinity in the aquarium is below 7 dKH (2.5 meq/L), add the stock sol’n at the maximum rate of 10 ml per 20 US-gallons daily until desired alkalinity is attained, then dose daily or weekly as needed (see below). Maintain the alkalinity within a range of +/-1 dKH. Once the desired alkalinity has been acquired, measure the alkalinity at the same time each day over a one- to two-week period to determine required dosing rate. To determine the daily dosing rate (preferable to weekly dosing): estimate the volume of water in the entire aquarium system; divide the daily decrease in alkalinity by 0.36 when measuring dKH or by 0.13 when measuring meq/L; multiply this number by the volume of water (gallons) in the system to get the daily ml of stock sol’n required to maintain stable alkalinity.